How has milk production changed since the 1950s? Intensive dairy practices and modified feeds have enabled U.S. dairy cows to produce 2.5 times as much milk today as they did in the 1950s. These intensive practices place dairy cattle under enormous stress to produce an abnormally large amount of milk, 10-20 times the amount of milk they need to suckle their calves. As a result, dairy cattle "burn out" at a much younger age than their normal life span or even the life span of a milk-producing dairy cow in the 1950s and consequently are culled and slaughtered at an early age. Up to 33% of dairy cows develop mastitis, a very painful udder infection that can become systemic, and is a common reason for early slaughtering. Abnormally large udders produce problems walking, so a cow's legs are usually spread apart, distorting the normal configurations of her pelvis and spine. Her back problems are aggravated when she must walk on hard ground and concrete. The dairy farms of today are quite different than the picturesque sunshine-filled meadows of contented cows we imagined as children. Today, most dairy cattle are confined to a barren fenced lot with a packed dirt floor, where they must endure all types of weather, including rain and extreme temperatures 24 hours a day. Factory farming systems (sometimes known as dry-lot) seldom provide shade, shelter or clean comfortable resting areas. Dairy cattle are often covered with their own filth because they cannot escape the dirty dry lot conditions. In colder climates dairy cattle may be provided shelter in winter, but most dairy practices remain the same. To boost their milk production, the cattle are fed high intensity feeds and grains that often cause digestive upset. They are also injected with Bovine Growth Hormone (BGH) to increase, by up to 25%, the already exorbitant amount of milk they produce. Of the 9 million dairy cattle in the U.S., 7-25% are injected with BGH. The use of BGH to increase milk production results in increased udder size and increased frequency of infection. The large numbers of cattle that are crammed into small spaces where the soil is hard and compact increases the incidence of injury and lameness as well. Some dairies have up to one thousand cows, which means the factory dairy farmer may often fail to recognize that veterinary care is needed until the illness or injury has progressed beyond successful treatment ... and the cows are sent to slaughter. Fully 25% of dairy cattle are slaughtered before they are 3 years old. 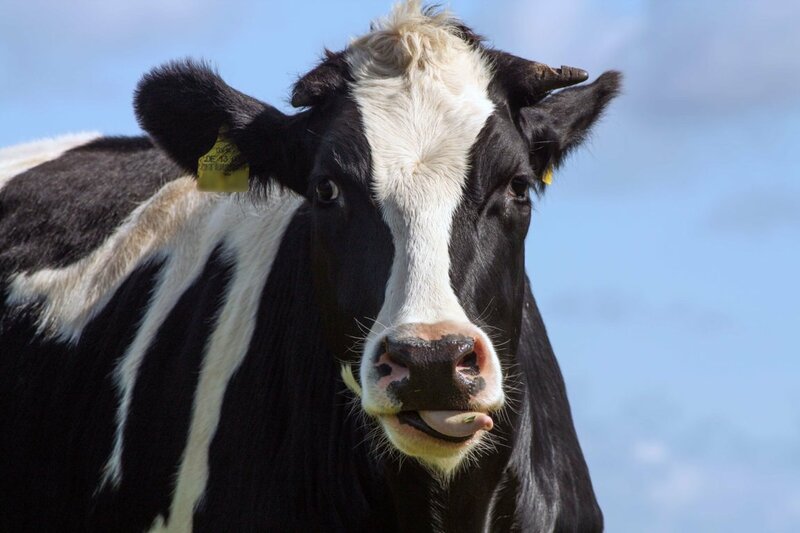 Only 25% of dairy cattle live more than 7 years, although the natural life span for cattle is 20-25 years. (The oldest cow on record lived to be 49 years old.) Injury, illness, milk production lower than optimum, poor conception rates, and other factory-farming-induced health problems are common reasons dairy cattle are sold for slaughter long before they have lived out their natural life span. Every year 17 million shots of antibiotics are given to cattle for infections related to milk production and other diseases. Most commercial ground beef is made from the meat of culled dairy cattle. Because dairy cattle have not been raised specifically for human consumption, dairy cattle have often been treated with antibiotics shortly before being butchered in an attempt to cure the disease that later resulted in their being killed. Therapeutic antibiotics are also routinely given to dairy calves and cattle. This means that antibiotics are entering the human food chain through the consumption of the milk and meat of dairy cattle. Many experts feel that the excessive consumption of antibiotic-tainted animal products has created a number of antibiotic-resistant bacteria (superbugs) that may be a threat to human health. A heifer (female) calf will probably remain on the farm to replace her mother or some other worn-out milk producer. A bull (male) calf is usually thrown in a truck and sent to an auction while he is still wet with amniotic fluid, still unable to stand by himself. Many bull calves die at the auction yard and those who don't are often sold to a veal operation, where they live out their short lives confined to a tiny crate that prevents almost all movement and fed an iron-poor diet to make their flesh pale. For calves reared as replacement heifers, life is not much better -- farmers make feeding and maintenance easier by housing the heifers for the first few months of their lives in crates barely larger than veal crates. The days of a calf being born in a field and being nurtured by her dam are long gone. Calves are separated from their mothers within 24 hours of birth, and weaned from milk within 8 weeks (calves will gladly suckle for as long as eight months if allowed to do so). A calf separated from her mother at an early age does not receive any immunities through her mother's milk, and is therefore vulnerable to disease -- a 10% mortality rate is common. The nearly half a million factory farms in the U.S. produce 130 times more waste than the human population. Cattle produce nearly one billion tons of organic waste each year. The waste from livestock, chemicals, fertilizers, and pesticides are a primary source of water pollution in this country. Wastes from dairies, feedlots and chicken and hog farms enter waterways, damaging aquatic ecosystems and making the water unfit for consumption. Cattle also emit methane, carbon dioxide, and nitrous oxide, three of the four gases responsible for trapping solar heat. You can take an active role by decreasing or eliminating meat and dairy products from your diet. You and the cattle will both benefit from your efforts. The Dietary Guidelines for Americans published by the U.S. Department of Agriculture and the U.S. Department of Health and Human Services endorses vegetarian diets. Seven common diet-related conditions -- heart disease, hypertension, cancer, diabetes, gallstones, obesity, and food-borne illness -- are attributable to meat consumption. (For a copy of the report, write: Secretary of Agriculture, U.S. Department of Agriculture, Washington, DC 20250.) Report any suspected farm animal abuse or neglect to your local authorities.